Children at Little Trinity Nursery in Kidderminster are full of excitement and wonder as they explore the many functions and games of their new interactive screen. Nursery manager, Miss Gaynor Carter, said: “We decided to provide the children with a new 32” interactive screen, as it’s so large that 3 or 4 children can easily sit together and play. 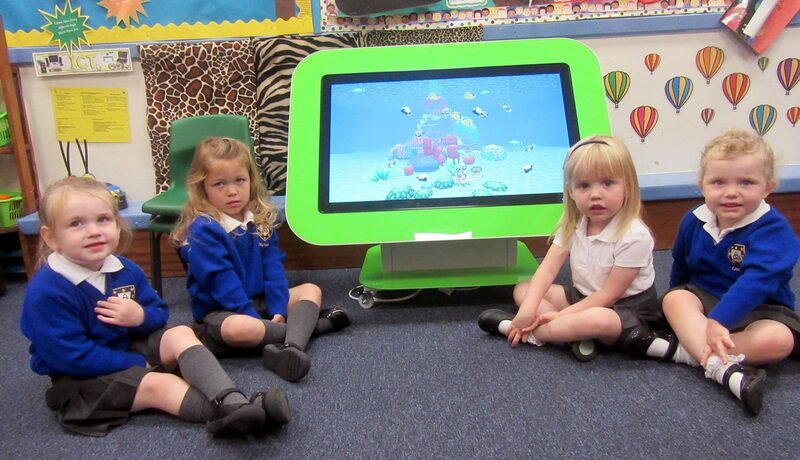 “Everyone has the opportunity to use it throughout the nursery day, with the screen designed to help encourage communication skills and promote interaction between the children, whilst quietly developing their negotiating skills as they have to work together as a group.” The interactive screen is designed to support collaborative play, whilst promoting and nurturing the early development of IT skills, and as the children become more accomplished, additional applications support and benefit learning in maths and literacy work. Early Years personal, social and emotional development activities are encouraged at Little Trinity Nursery with all children supported as they investigate through touch, smell and taste. Added Miss Carter: “Little Trinity recognises that technology is key for this generation of children and so to ensure we have the right resources available we decided to encompass interactive play for groups of children by providing a large 32" screen, which the children, and staff, simply love to use!” The Nursery’s new interactive screen helps to perfect the children’s drawing and mark-making skills through games such as Peppa Pig, and for the younger children there is a large selection of sensory applications to choose from.